Give a whole new dimension to your X-Wing parties! Featuring a reinforced hull and a laser gun turret, the VT-49 Decimator was primarily used for far-sighted reconnaissance and border defense missions. One of the most feared warships in the Imperial arsenal, this unit was only trusted by the most promising officers. 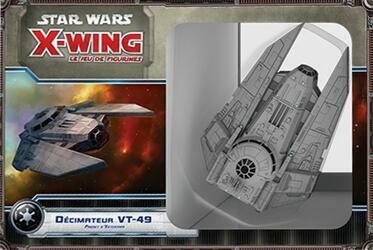 This Expansion Pack includes everything you need to add 1 VT-49 Decimator to your games.